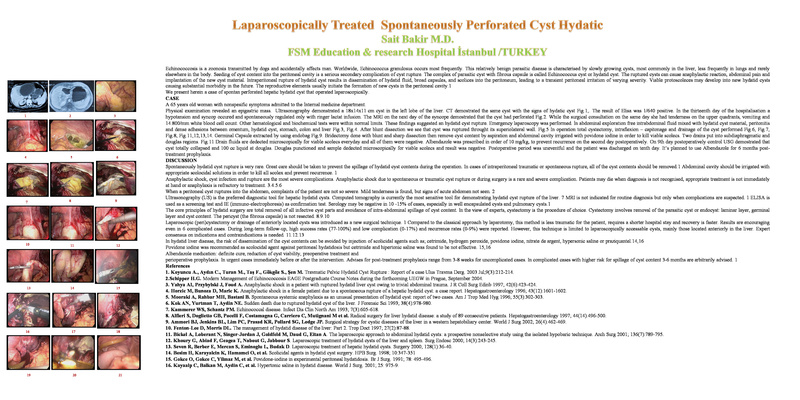 We present herein a case of spontan perforated hepatic hydatid cyst that operated laparoscopically. A 65 years old woman with nonspesific symptoms admitted to the Ýnternal medicine department. Physical examination revealed an epigastric mass. Ultrasonography demonstrated a 18x14x11 cm cyst in the left lobe of the liver. CT demostrated the same cyst with the signs of hydatic cyst The result of Elisa was 1/640 positive. Ýn the thirteenth day of the hospitalisation a hypotansion and syncop occured and spontaneously regulated only with ringer lactat infusion. The MRI on the next day of the syncope demostrated that the cyst had perforated While the surgical consultation on the same day she had tenderness on the upper quadrants, vomiting and 14.800/mm white blood cell count. Other hematological and biochemical tests were within normal limits. These findings suggested an hydatid cyst rupture. Emergency laparoscopy was performed. Ýn abdominal exploration free intrabdominal fluid mixed with hydatid cyst material, peritonitis and dense adhesions between omentum, hydatid cyst, stomach, colon and liver After blunt dissection we see that cyst was ruptured throught its superiolateral wall. Fig.5 In operation total cystectomy, intraflexion – capitonage and drainage of the cyst performed Germinal Capsule extracted by using endobag . Bridectomy done with blunt and sharp dissection then remove cyst content by aspiration and abdominal cavity irrigated with povidone iodine in order to kill viable scolecs. Two drains put into subdiaphragmatic and douglas regions. Drain fluids are dedected microscopically for viable scolecs everyday and all of them were negative. Albendazole was prescribed in order of 10 mg/kg, to prevent recurrence on the second day postoperatively. On 9th day postoperatively control USG demostrated that cyst totally collapsed and 100 cc liquid at douglas. Douglas punctioned and sample dedected microscopically for viable scolecs and result was negative. Postoperative period was uneventful and the patient was discharged on tenth day. It’s planned to use Albendazole for 6 months post-treatment prophylaxis.